Eliminate the need for costly scraping and painting of unsightly bollards. 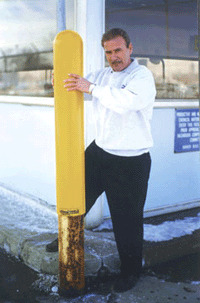 The low density polyethylene thermoplastic molded sleeves slide over existing bollards. No hardware needed. Additional sizes and colors available - Yellow, red, blue, green, grey, brown, black, white - Please specify color in notes when ordering.